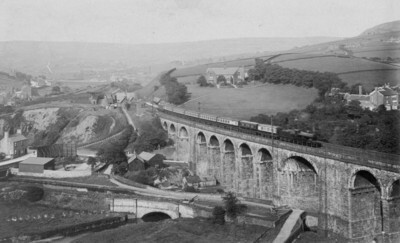 The location is Saddleworth Viaduct and the engine is a Whale 4-cylinder compound Benbow. But what is the train? And what else can be said about the picture, the scene, train etc etc? As always: What? Where? When? Picture is not later than June 1909 when my original was posted. Saddleworth station is just visible at the rear of the train. Below left is the Huddersfield Canal, passing through an area known as Brownhill Bridges. The canal goes across the river, through the lock (Lime Kiln Lock) and under the viaduct. Just to the left is a derelict looking Brownhill quarry. In another similar postcard view I have the card is captioned Dobcross Viaduct - can anyone confirm this as an alternative name or is this a publisher's error? John welcome to the confusion that is Saddleworth. The two cottages – far left & centre – face what is now the New Dobcross rd. The 'ramp' – front lower right – is the alignment of the Old Dobcross road which originally crossed the river Tame – bottom left – and that crossing marked the place named: Dobcross (or earlier: Dob Cross) now some where under or adjacent to the viaduct. Saddleworth is a district and there is no actual village of that name. Through the viaduct to the right is the village of Uppermill which was/is best served by Greenfield station (on the old line) and later by Uppermill Station on the Micklehurst loop which was actually in Greenfield? Saddleworth station is about equidistant from the centre of the village as Greenfield and could more accurately be called: Dobcross in which Parish it lies were it not for the fact there was a station by that name on the Delph branch (Dobcross Halt). Above centre left – A horizontal white line marks the course of the railway and canal. The line loops around the back of the Dobcross Loom Works (tall chimney) and on to Diggle. I think this is probably a 5-coach Liverpool District non-corridor arc-roof set. These were reduced to four coaches from around 1909, which fits with John Alsop’s comment.